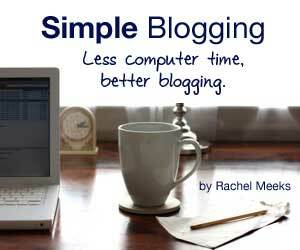 Do you only have a few hours a week to spare on working on your personal blog? Have you been meaning to start one but there is fear that it might take up way too much if your time? If you see yourself wanting to grow your blog but your lifestyle does not allow you a lot of time in front of the computer, I am recommending an e-book that might have the answers you are looking for. I stumble upon so many resources that help bloggers become better at what they do. I rarely promote them unless I truly believe that the content helped me and know it will help you too. The Simple Blogging e-book will teach you how to focus on the core message of your blog, stand out from the rest, and efficiently use your time getting it done. The author of this book is the lovely Rachel Meeks. I love her blog on living a simple lifestyle. If there is anyone who is an authority on the "less is more" philosophy, it is her. If you finally want to get your blogging life together this weekend, buy this e-book today for only $8. You will immediately access a 143-page PDF document that will dramatically help you manage your blog better. What intimidates you most about blogging? I have this. I bought it last year,and completely forgot about it!! I so need to open this up! This is great, Sam. I ended up buying it after going through Rachel's blog which I now love. Thanks for suggesting.